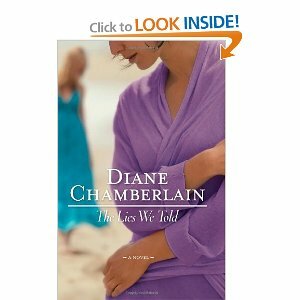 When I first received my copy of The Lies We Told by Diane Chamberlain, I noticed a comment that referred to Chamberlain as “the Southern Jodi Picoult” – a title, it said, that Chamberlain has been given by her peers. As a fan of Jodi Picoult’s novels, I was immediately interesting in finding out if Chamberlain had the same ease in storytelling that I enjoy in Picoult’s work. The Lies We Told chronicles the relationship between two sisters – Maya and Rebecca – who have survived a horrible tragedy. Having lived through the murder of their parents when the girls were 14 and 18 years old, they developed a strong bond. Maya becomes a pediatric doctor, married to Adam, who has dealt with his own tragedies in his youth. Maya desperately wants to have a child but finds herself dealing with yet another miscarriage and a secret from her past. Rebecca works for a disaster relief organization (DIDA) and continues to support her younger sister while deciding how to proceed with her own life and dealing with her own emotional baggage. Everything is turned on its head when disaster strikes and Rebecca goes off to help deal with its aftermath. Adam wants to help and joins her, pressuring Maya to come as well. Maya caves under pressure, appears to help with disaster relief and finds herself in the wilderness after the helicopter she is in goes down. Maya has to deal with her circumstances while Rebecca and Adam deal with their grief because Maya is missing and presumed dead. I enjoyed the ease in Chamberlain’s writing – she provides a strong plot and likable characters. The novel had almost a conversational feel, as if the sisters were taking turns telling the story of each of their lives. Because of this easy familiarity in her writing style, I felt like I could put down the book if I had to do something and return to it without concern because I could pick up right where I left off. I also loved the subtle twists and turns in the plot and what a creative storyteller Chamberlain is! I was truly astounded by how much I enjoyed this book! I now know that my summer reading will also involving tracking down Diane Chamberlain’s previous novels and reading them because The Lies We Told has quickly become one of my favourite books of 2010! Honestly, I’m not a Jodi Picoult fan. I can’t seem to finish her books, although I have tried. Her stories are good, but the story telling doesn’t fit me. However, your description of Chamberlain’s writing as conversational makes me want to read her. Thanks for the review. This sounds like such a great book. I have really been wanting to read it and now after reading your review, my desire to do so is tenfold!! Thanks April! I really appreciate hearing readers’ responses to my reviews – I can’t wait until I go on holidays so I can relax and read more of her books! I have read something that She wrote but can’t remember what. I read 8-12 books a week so there’s no way I can remember but I remember her name. I would love to win this. Thanks for giving me the chance! Public Follower on Google Friend Connect. Thanks for aall the extra entries.